Have you ever had one of those weeks where you were amazed at how busy your schedule was, yet surprised at how little you seemed to get done? That was last week for me and the blitz of activity left me little time to cook, let alone eat something good for me. Lunch was reduced to a handful of jalapeño-flavored potato chips and half a curried tofu sandwich. Dinner was an even more embarrassing affair consisting of leftover boiled potatoes drizzled with olive oil and followed by gelato straight out of its paper container. I was starting to feel like a human garbage disposal, and was yearning for a real meal, meaning something satisfying that was also quick and easy to put together. 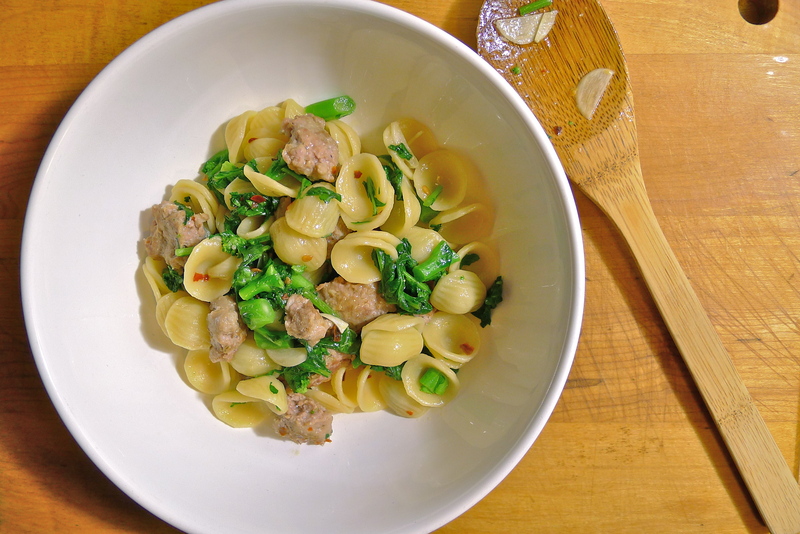 Orecchiette with Sausage and Broccoli Rabe fit the bill perfectly as simple, rustic Italian seems to be my go-to cuisine when my belly is rumbling and my eyes are blinkered from low blood sugar. One of the emblematic pastas of Puglia, orecchiette are thus named because they are supposed to resemble little ears. I don’t know about that, since they only look like ears to me if we’re talking (nerd alert!!!!) Ferengi ears. I do know that they are delicious and are perfectly shaped to cup little bits and pieces of chopped vegetables. The bitterness of broccoli rabe always goes well with savory sausage, garlic and red chili pepper flakes. To make this dish vegetarian, simply omit the sausage. It is very tasty that way as well. As this is a very simple dish, I have given you proportions for two, even though I ate the two for one. 1. Bring a large pot of salted water to boil. Cook the pasta until it is al dente. 2. While the pasta is cooking, heat a little bit of olive oil in a heavy skillet over medium-high heat. When the oil begins to shimmer, pinch off one-inch pieces of sausage and brown them in a single layer in the pan. When the sausage pieces are browned on all sides and cooked through, remove them to a paper towel-lined plate or bowl. 3. Drain the pasta, reserving about a 1/4 to 1/3 of a cup of the pasta water. Wipe out the skillet and add about 2 tablespoons of olive oil to the pan. Set the pan over medium heat and sauté the garlic slices until they are fragrant, about a minute or two. Add as many chili pepper flakes as you like and continue to sauté for about 30 more seconds. Be careful that the chili pepper flakes don’t burn. Add the chopped broccoli rabe and a little bit of the pasta water (you can always add more water later if the dish starts to look a little dry) to the pan. Cook the rabe until it begins to wilt. Add the sausage and the pasta, along with another splash or two of pasta water if needed. Toss and let everything cook together for another minute or two. The pasta should begin to absorb some of the sauce. Adjust the seasoning if needed. Serve in large warmed bowls with an additional drizzle of olive oil. I’m sure this would be awesome with gnocchi, because you’re right: everything is good with gnocchi! Broccoli rabe is terrific! If you see it at the market, definitely give it a try! How do you get your food photos to look so darn nice? Seriously. I need to know. Every time you post new food pics I’m like a deer in the headlights. I can’t stop staring at the pics. Are you using Photoshop? Hungry Town….is that like Funky Town for foodies? I have to admit that I have no experience at all with broccoli rabe but your pics make me want to try some! Awwww! Thanks, Lady! I hope to keep getting better at the picture taking. Sometimes, when I look at the photos that I took when I started this blog, I just cringe! I wish I could afford Photoshop or Lightroom, but both of those are kind of out of the budget right now. I just use iPhoto. What I do though, is really play around with my camera settings. I use the macro setting for food. I never use the flash, instead I adjust for low light. Most importantly, I learned how to manually adjust the white balance on my camera. I’m still learning though. For people who are really big into photography, I probably am doing this all wrong! But it’s definitely worth it to play around with your camera settings. You would be amazed how much you can do even with a simple point and shoot. And Hungry Town is definitely Funky Town for foodies! Dried pasta is one of the triumphs of the modern kitchen. So easy to prepare, cheap and filling. I must confess, I hardly ever branch out from the 3 pastas I usually buy: spaghetti, penne or spirals. If I’m feeling fancy, I’ll get fettucine or macaroni. I’ve never tried orrechiette. Knowing that we had a busy week ahead of us last week, we went to the market with the intentions of having easy cook meals. Our trolley looked like a bachelor’s trolley and my husband was very happy (He loves bachelor food). Meals consisted of some kind of processed meat (ham slices or half a pie) paired with mashed potatoes and buttered peas. It looked like real food but were really easy to whip up without much supervision in the kitchen. I did an easy spaghetti bolagnaise one day last week too, which is awesome for lunches the next few days. I find when I’m busy, I either eat terribly (nothing) or I eat really well by treating myself to very good bought lunches. Sometimes that happens to me too. I get in a pasta rut. I also have been guilty of stocking a “bachelor’s trolley” — which is great phrase, actually — full of frozen pizza and microwave popcorn. It’s so true though that when I get really busy, I eat crappily or go nuts at a restaurant and order all kinds of fancy things! Thanks, Kay! I hope you’re enjoying the sun today! I don’t know what it is but sausage and greens is the main reason that I can’t claim vegetarianism. I love the combination! I know! Even when I was a vegetarian, sometimes I would cheat and eat bacon and sausage. It tastes even better when paired with greens! So, does that mean that it was meat-eating was meant to be? We’ve been on a broccoli rabe kick here too, in anticipation of great local spring greens. So wonderful with orecchiette and sausage. And, I have to admit, I’m nerd enough not to have to click the Ferengi link to know what you mean (being a Next Generation/Picard girl myself)! We are just starting to get spring vegetables. Ramps are in . . . 6 weeks early!